"In the beginning, there was silence." In the beginning was silence. Not silence as absence of sound, but the roaring rushing silence of everything else. Some argue that there’s no speed of light, only the speed of dark, and what’s to say silence is any different? Silence not as the absence of sound, but as the sound itself. My first experience working with deaf actors came in a string of firsts - first time stage managing at Stonewall Inn, first time working with a Tony-nominated actor (Austin Pendleton), first time working for a Jesuit theater company, first time handling a Nazi flag as a prop. I loved working on The Chalice, and to this day I’m proud to have it on my resume. Our deaf actor, Margaret, revealed a new way of experiencing theater. She relied on my awkwardly wiggling fingers to indicate "stand by" and "go" as I listened for her cues. The graceful interpreter's fingers danced during rehearsals. Yes, it was harder for her to blatantly interrupt a conversation, but her observant eyes and wry smile communicated far more than I expected. In the crowning soliloquy of Children of a Lesser God, Sarah, Lauren Ridloff's heartbreaking and complex character, explains that more can be said in one sign than spoken in 50 words. Two hands together, thumb and index finger touching, other digits splayed upwards, connecting thumb and index interlocked, hands moving between two people. This indicates a deep, intimate relationship. The beauty of this simple example fits perfectly in the context of the play, which is a heartbreaking and complicated glimpse into relationships, psychology, and silence. That simple sign, and the disappearance of it, sums up in one gesture what takes 2.5 hours to play out on a stage. In a nutshell: boy falls for girl, girl resists, boy persists, girl gives in. Marriage. A home. Every relationship has its complications, and here the wife is deaf. No biggie - her husband is a speech therapist, and more (or less, as we discover) fluent in ASL. Somewhat predictably, we know this marital bliss has an expiration date. Perhaps because it felt awkward from the start (daddy issues, anyone? ), perhaps because both James and Sarah want something the other can’t give. Perhaps because - and let's call a spade a spade here - they’re both pretty bad at communicating. The theme of “Ontogeny recapitulates phylogeny” returns in droplets throughout the play. As interpreted by the playwright, this means making someone over in your own image. 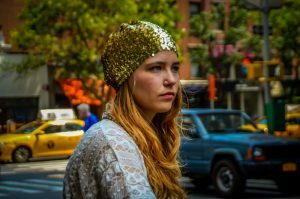 James cannot escape the desire to make Sarah in his image, Orin (Sarah’s hard-of-hearing friend and staunch defender of deaf rights) wants to make Sarah in his image. The lawyer, desirous to cast a helpless, sad, “pure deaf” girl in her legal case, desires to make Sarah in her image too. We’re left to wonder what Sarah’s image is, and her painful, grueling sobs are evidence that she’s wondering the exact same thing. It’s no surprise that the couple splits in the end. What is surprising is that, despite our inability to sign ASL, we understand her far better than any character who speaks out loud. Her elongated, gutteral, agonizing scream of frustration could fill a library of pain. Moreover, we think sign language is silent, but in truth it’s full of sound, meaning, significance. “You are changing nothing until you change who is right,” Sarah explains. She’s the specimen in a petri dish that fights back. From a production standpoint, the relatively sparse and neutral-toned set allowed us to focus on the ASL signs, body language, and chemistry between the characters. The setting rapidly changes - school, lake, Sarah’s room, her mother’s house, lake, school, etc. - and the modular set with simple platforms that double as a restaurant table and bed do not distract from more important dialogue and story. I even enjoyed the written captions above the stage, suited perfectly to hard-of-hearing audience members. I became fascinated when the actors’ words differed from those written, and wondered how much license they had to “mess up” or accidentally change a line from “I’m finished” to “I’m done” depending on the shape of the words reflexively in their mouths. My one criticism comes at the very end. The story concludes, the audience sniffles with suppressed tears, and the theater is plunged into darkness. There is one sound effect, which the closed caption describes as “(Whoosh)”. Ugh. The heartbreaking moment when we return to real life is introduced with a quirky sound more appropriate to Superman’s cape. 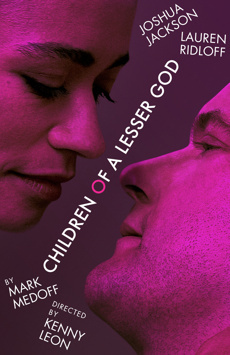 Children of a Lesser God enjoys an illustrious history, and this revival is sure to make waves. Even when this production closes, the story's timeless plot and tearjerker ending are sure to fill houses for many decades. Silence is the loudest sound on earth. Remember to bring your tissues.